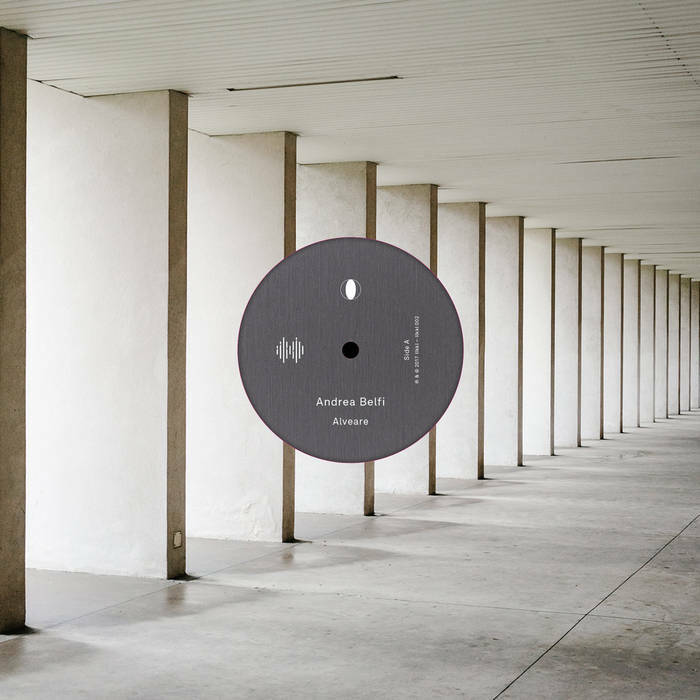 Alveare, a collection of electroacoustic music by Italian percussionist / composer Andrea Belfi, is part of a collaborative multimedia project with photographer Matthias Heiderich. Inspired by Heiderich’s pictures of the modernist housing complexes put up in Italy after World War II, the LP’s five tracks were composed and played between 2007 and 2016. As befits Belfi’s status as a percussionist, all are firmly set on a foundation of rhythmic drumming or percussion work, often wrapped in an atmospheric overlay of electronics. Grigio, which features cellist Audrey Chen as guest contributor, adds microtonally discordant sustained tones given various colors through changes in bow position. Abito creates the illusion of sounds passing back and forth in space, courtesy of guest artist Attila Faravelli on rotating speakers. The spare regularity of Belfi’s music aptly complements the visual rhythms of Heiderich’s images of these buildings’ unornamented, exposed concrete surfaces. Source: jazz.org, Douglas and friends will be performing this piece on March 3rd and 4th. Trumpeter Dave Douglas is a prolific composer and a powerful performer of improvised music. His output as a bandleader is one of the most eclectic in history, featuring dozens of groups on over 50 unique recordings. Metamorphosis marks a bold new conceptual approach to organizing music for improvisers and features an all-star gallery of legendary voices. For this special engagement, Douglas has enlisted some of the most influential modern improvisers, many of them Douglas’ own heroes: trumpeter Wadada Leo Smith, saxophonist Oliver Lake, drummer Andrew Cyrille, guitarist Marc Ribot, pianist Myra Melford, bassist Mark Dresser, and percussionist Susie Ibarra. For Roulette’s second season presenting shows curated by Meredith Monk, American Contemporary Music Ensemble (ACME) will perform works by Timo Andres, Meredith Monk, and Caroline Shaw. This concert celebrates the release of ACME’s new album, Thrive on Routine, available on Sono Luminus in February 2017. Bonjour is a low string band with drums/percussion founded in 2012 by bassist and composer Florent Ghys whose performance corresponds to the Museum’s exhibition Pierre Chareau: Modern Architecture and Design. Ensemble mise-en’s Portrait Series seeks to celebrate the landmark works of distinguished composers of contemporary music. This series is aimed towards presenting the music of these composers to a wide spectrum of listeners who are engaged in or curious about contemporary art music from around the globe, such as music students and educators, new music enthusiasts, as well as New Yorkers and visitors. The inaugural concert of the series will feature a pair of Nordic composers: Djuro Zivkovic (Serbia/Sweden) and Thomas Agerfeldt Olesen (Denmark). Composer-keyboardist Gordon Beeferman debuts a new organ trio with guitarist Anders Nilsson and drummer/percussionist Ches Smith. The trio will premiere a brand-new concert-length set of five pieces that traverse and investigate unusual moods, forms, rhythms, and sound-worlds. Harpist Kate Sloat performs contemporary works for solo harp. Featuring works by Lowell Liebermann, Brian Erickson, and many more. The Attacca Quartet continues their Recently Added series with a performance of Michael Ippolito’s complete string quartets and coincides with the release of Ippolito’s newest album Songlines. Alongside original works by the Sound and the Light, they will be presenting arrangements of works by von Bingen and Elgar, and pieces by Bartók and Mazzoli.